https://www.youtube.com/watch?v=vheFSX6UaXs Every chicken does these 2 weird things. One is a “dust bath”. The other is “molting”. Learn all about them in this video. Get my chicken book here. 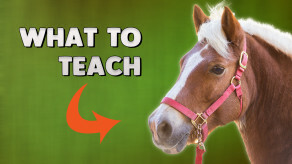 Horse Training: The FIRST 3 things EVERY horse needs to learn. When you move to the country from the city you might feel like you don’t fit in. In this video I give you some tips and advice on what you can do to make yourself feel more at home in your new country life. First you’ll learn horse hoof anatomy, then what tools you need for horse hoof trimming, then how to trim horse hooves step-by-step. This video is for beginners who want to learn barefoot hoof trimming. Mini no bake cheesecake. These mini cheesecakes are fast, fun and delicious. This no bake cheese cake is a healthier option than a traditional cheesecake. A fast, fun recipe that everyone will love. Put a smile on your family’s face when you serve these up. What a way to end a meal. The Most Delicious Simple Pumpkin Pie Recipe Ever! Becky shows you what she has in her survival kit. It’s worth the effort to put together an emergency survival kit so if a disaster happens you’ll have enough emergency supplies to make it through. While your neighbors are sitting around waiting for someone else to save them you’ll be prepared with emergency kit. This healthy dessert recipe is perfect for your diet. Becky shows you her banana cake recipe. This easy dessert recipe is great for your diet because it uses whole food ingredients that are high quality and this diet cake recipe is also low in sugar. Becky shows you how to decorate a flower pot then use it as a fun little herb garden. This is a great idea for you to get started gardening and it also makes a great gift. Becky shows you how to make a rain barrel. There are so many different after school activities out there, sports, FFA, karate. Some after school activities you might not have thought about are homesteading after school activities. Homesteading is doing for yourself, you can make your own soap, a container garden, 2 hens for eggs. Whatever you can manage. Every homestead is an individual and that’s what makes it special. It’s whatever creative beautiful little eco system you can create on whatever size property you have. Becky talks about how homesteading can transform your life and make you more relaxed and stress free. If you’re asking what is a title company, this video answers that question. Becky explains why you would want to use a title company when you buy land or a house with owner financing. 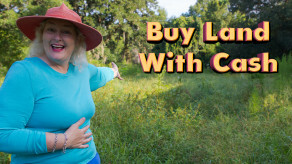 Get Becky’s Guide To Buying Land eBook here. Learn all about heat stroke in chickens, what the symptoms of heat stroke look like, and how to treat your chickens for heat stroke. I show you how to take care of your pot belly pig. Becky shows you how to use a circular saw, cordless drill, level, tape measure, hammer, and square. These are tools every homestead needs. Becky talks about the reasons she chose to build a log cabin kit and why it could be a good option for you. How much does it cost to live on a homestead? Becky talks about her bills and how much it costs to live on a homestead. Ponies, Horses, Donkeys, & Mules: Everything you need to know. Becky gives you an overview of the difference between ponies, horses, donkeys, and mules. Mites & ticks on your chickens can be a real problem. If your chickens start having bald spots with red skin underneath then it might be mites or ticks on your chickens. The all natural cure for mites and ticks on your chickens that I recommend is diatomaceous earth. How to tell if your chickens have worms and what to do about it. Changing your lawn mower blade isn’t that hard. You can save a bunch of money by doing it yourself. What are the prices to butcher a hog? Becky gives you some girl power inspiration. One woman really can accomplish a lot in life. This inspiring true story shows young woman everywhere that they have endless girl power and that a determined woman can accomplish anything! Becky’s Full Size Chicken Coop Design I designed this coop to be great for you and your chickens. It’s easy to build, keeps your chickens safe, and most importantly it keeps them happy so they lay you lots of eggs. How many chickens can I have? In this short video I go and buy some mini ducks and a meat pig. This is a fun soap recipe to make for someone who loves playing Minecraft. Recipe 24.25 oz Distilled Water 9.7 oz Lye 54 oz Coconut Oil Supplies See even more tools and supplies here. Becky plants some baby zucchini that she started indoors out in her homestead garden. Becky shows you a tour of her small garden. This year she’s growing onions, roma tomatoes, peppers, potatoes, cucumber, squash, eggplant, and blueberries. She talks about how she fertilizes and keeps out ants. And she also chases Neil the pig out of the garden. Is an adjustable rate mortgage a good idea? In this video Becky gives you the balloon mortgage definition, and she explains what an adjustable rate mortgage is. She tells you what mortgage types she likes the best and gives you advice on how to set yourself up to pay off your mortgage as fast as possible and start living mortgage free. Becky talks about how to get mortgage free. How she did it, and what steps you need to take to get mortgage free. You can start seeds indoors without spending money on those expensive seed starter cups. In this video I show you how I use inexpensive paper cups to start some heirloom tomato seeds inside. Becky shows you how she catches her mules. They used to be hard to catch but then Becky discovered Meredith Hodges training. Becky followed her advice and now after a couple months of training the mules are much easier to catch. 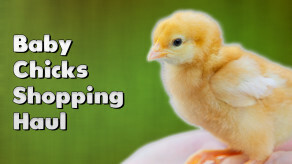 Becky answers a question from Reva about what’s the best bedding for baby chicks. Becky talks about hay, newspaper, and wood shavings or wood chips. She talks about the good and bad about each one and tells you what she chooses to use for chicken bedding. Becky explains what she did to lose 30 pounds. She talks about the changes she made in her life and what workout and fitness app she recommends. Becky talks about how big your pasture needs to be to keep horses, how big her water trough is, what kind of shelter she built for her horses, and also how she built the gate for going in and out of the pasture. 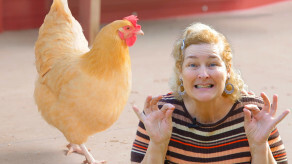 Becky shows you what she feeds her chickens so they lay eggs all year long. Becky gives you a list of the supplies and tools you’ll need to make soap at home. How to roast a whole chicken in the oven. Becky shows you how to make soap bars with olive oil, lye, and water. Becky shows you how to deworm your cats naturally without using any chemicals. Becky shows you how to take apart and clean your window air conditioner. Then she shows you how to put it back together. Becky shows you how to deworm your dogs naturally without using any chemicals. A tour of Becky’s small log cabin kit. She shows you how to make it work with 800sq feet. Becky shows you her horse worming schedule. She explains exactly how she keeps her horses worm free using diatomaceous earth. Becky shows you how to make Gluten Free Banana Muffins/Cupcakes with homemade frosting. Becky shows you how to clip chicken wings safely and effectively. Becky visits a u pick bluberries farm. She explains how it’s a good way to get fresh fruit and vegetables even if you don’t have your own garden. How Becky turns a 300lb pig into ribs, ham, & bacon. From garden to table, Becky shows you how to make a delicious homestead egg and potato breakfast. How to make a potato tower. Becky shows you how to grow potatoes in a potato tower. Making a potato tower is easy to do, and it’s a really good way to grow some fresh potatoes for your family. 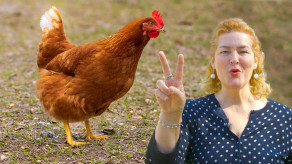 Becky shows you 3 chicken breeds that she recommends. Becky shows you how she plants heirloom seeds in her raised bed garden so she can grow her own organic food. What to plant in a winter garden? Two plants that grow in winter are broccoli and brussel sprouts. In this video Becky shows you how she plants them in her raised garden beds. Are your chickens not laying eggs? Here’s what you can do about it. Why are my chickens not laying eggs? It can be a very frustrating question. In this video Becky shows you how she dealt with some issues in her chicken coop that were hurting egg production. She also shows you some other things you can look out for that might stop your hens from laying. In this video Becky shows you how a 42 year old women can sell everything, escape the rat race suburbs, build her own log cabin, and start living the debt free homesteading lifestyle. Protect your family from the risk of carbon monoxide buildup by changing the wick in your kerosene heater. It’s really easy and Becky shows you how in this video. Becky gives you ideas on how to raise pigs for meat. She gives you a tour of her pig pen, shows you how she gets it ready, then Becky visits a local pig farmer to pick up her two new baby pigs. 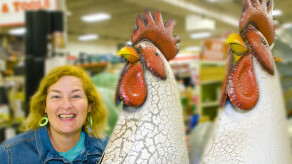 Becky talks about how she ordered chickens online from Meyer Hatchery. Becky gives you a tour of the chicken coops on her homestead. She gives you some ideas for the different chicken coop designs you can have. Becky’s goat milk soap recipe. Becky shows you how to make soap with lye, goat milk, olive oil, & lavender. Becky’s beginner bar soap recipe. Cold process soap with only 3 ingredients: lye, lard & water. Becky shows you how to make your own bar soap from start to finish in this homesteading video. Learn how to take care of chicky babies. Look over Becky’s shoulder as she gives you a quick tour of everything she’s doing on her homestead. Does your horse have a hoof crack that won’t go away? Becky shows you how to fix it for good. I LOVE brownies. Here’s my recipe for brownies that are pretty easy to make. How to worm your chickens without using chemical pesticide wormers. Becky helps a beginner get started with her own container garden. If you just bought a driving harness for your horse, donkey, or mule, and you don’t know what all the parts & pieces are this video is for you. If you want to make homemade liquid laundry soap this homesteading video is for you. How to cook the perfect fried egg. 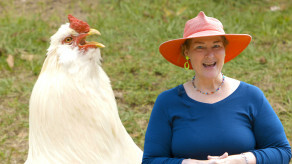 #213 In this episode Becky shows you what to feed chickens so you get plenty of farm fresh eggs. Raising chickens in your backyard is really easy if you know a few simple things about how to keep your hens fat and happy. #212 In this episode Becky shows you how to harness up a donkey or horse, she talks about all the parts of a harness, and then shows you how to teach a donkey or horse how to drive and pull a cart. 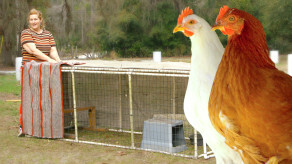 What 3 Chicken Breeds Make the Best Laying Hens? What Is The Best Chicken Coop Plan? 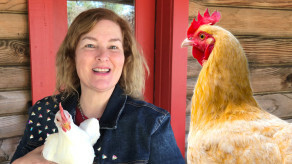 #211 In this episode Becky talks about raising backyard chickens for farm fresh eggs. She gives you a tour of both of her new chicken coop designs. #210 In today’s episode Becky shows you how to make a permaculture garden. #209 Becky visits her friend Kat’s homestead, and Kat shows Becky how to milk a goat, then they go into the kitchen and make home made goat cheese from scratch. #204 In this episode Becky talks about her first time canning and tells you all about it. She also talks about pulling wires for the log cabin electrical, and reads your homesteading letters. #203 In this episode Becky talk about being financially independent, her new baby horse, and Becky reads your letters and answers your homesteading questions. #201 In this episode of Becky’s Homestead, Scott shows you how to build a recycled chicken egg laying nest box for your backyard poultry. 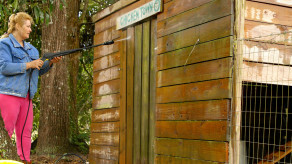 Becky talks about insulating her log cabin roof deck with icynene spray foam insulation. #125 In this episode Becky shows you everything you need to know about chickens for your homestead. 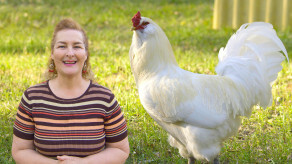 She talks about baby chickens, roosters, hens, egg production, what to feed chickens, and tips for making sure your homesteading chickens are happy. #124 In this episode Becky answers the question: How long does building a log cabin take? She talks about the spring garden on the homestead and answers your homesteader questions and gives encouragement and advice. #123 In this episode Becky shows you the different types of cast iron cookware she uses in the homestead kitchen, she also gives advice on cleaning your cast iron cookware. #122 In this episode Becky talks about a great design for a bird feeding station, Belgian draft horse heavy pullers and how to do their shoes, and Becky answers your mail. #121 In this episode Becky talks about Granite, Bartering, she talks about “The Creative Habit” by Twyla Tharp, and Becky reads your letters. #118 In part two of this two part series, Becky talks about how to build a log cabin yourself. She discusses the roof, framing, electrical and plumbing. #117 In part one of this two part series, Becky talks about how to build a log cabin yourself. She discusses the foundation and logs. #115 In this episode Becky has a special report from John Flowers of www.LifeZero.org. John gives us a tour of his Life Zero apartment. Becky also reads your letters. #114 In this episode Becky visits the library and speaks to the Librarian and Master Gardener, Patty. Becky and Patty talk about books for the homesteader, starting seeds, and they answer questions from the audience. #113 In this episode Becky talks about how to raise and care for baby chickens. She discusses feeding, housing, and watering. #112 In this episode Becky teaches you how to sharpen an axe. #111 In this episode Becky talks about heating your home with kerosene. Becky also talks about a really good book by Michael Pollan. #110 Our 10th episode! In this episode of Becky’s Homestead, Becky shows you how to build a light weight chicken coupe, so you can have fresh eggs. Becky also talks about debt. #109 In this episode Becky shows you how easy it is to clear your land yourself. #103 In this episode Becky visits Alpaca Ambassadors Inc Ranch. #102 Becky talks about Bartering, Horse Breeding, and Heirloom Seeds. In our first episode you get to meet Becky, and she gives you a quick tour of her homestead.